"Dusk Till Dawn" is a song recorded by British singer and songwriter Zayn featuring Australian singer and songwriter Sia. It was released as a single on 7 September 2017 by RCA Records, and appears on the Japanese edition of his second studio album Icarus Falls (2018). It was written by Zayn Malik, Sia Furler, Alex Oriet, David Phelan and Greg Kurstin, and produced by Kurstin. The song's accompanying music video was released on the same day, it features Zayn and British-American actress Jemima Kirke. The song is also featured in the official trailer for the 2017 film, The Mountain Between Us. Commercially, the single peaked at number five on the UK Singles Chart. It also topped the charts in seven countries and peaked within the top ten of the charts in more than twenty countries including Australia, Belgium, Canada, Finland, France, Germany, Ireland, Italy, the Netherlands, New Zealand, Norway, Portugal, Scotland, Slovenia, and Sweden. "Dusk Till Dawn" is a pop power ballad. Fact described the song as "stadium ballad" and further saying that "instead of running away from his pop roots [Zayn] seems to be relaxing and re-embracing those pop beginnings". In speaking about the song, Zayn said, "That's where I started and that's obviously still in there. I still like pop music, but it's about putting my own spin on it, making it me." The song is in the key of B minor with a tempo of 180 beats per minute. The meter is common time. The harmonic progression is Bm7–G–D–F♯m7/C♯–Bm7–G–D–A/C♯. The vocals span two octaves, from D3 to D5. Hugh McIntyre from Forbes said the song is as "epic as it needed to be considering the two powerhouses attached." He noted that it "features powerful vocals, high notes left and right and a vocal hook that is somehow impossible to sing along to, while still being memorable." McIntyre also predicted it could be a potential Grammy Award nominee for Best Pop Duo/Group Performance; the song's producer Greg Kurstin won Producer of the Year at the 2018 Grammy Awards for his work on "Dusk Till Dawn" along with several other songs. Michael Cragg of The Guardian chose the song as "track of the week" and described it as "a towering piece of perfect pop." Elias Leight from Rolling Stone described the song as "throbbing ballad" and said that the duet "leans close to her [Sia's] trademark style", further stating that "Sia dials back her potent voice to harmonize better with Malik; she often handles the low end, while his singing flutters around in the falsetto range." MTV called it a "massive, cinematic duet" and concluded that it "starts off as a gorgeous, romantic mid-tempo and builds to a thrashing sing-along chorus that will echo around stadiums in no time." 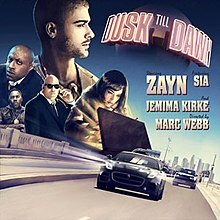 Jordan Sargent, writing for Spin, said "Dusk Till Dawn" was "a step backwards" from Zayn's previous single, "Still Got Time", and further commented that the collaboration with Sia was "fairly predictable and mostly uninteresting". As of September 2017, "Dusk Till Dawn" moved around 58,000 digital copies in the United States according to Nielsen SoundScan. The track sold 28,561 downloads in the UK during its first week. By 5 October 2017, the song had sold around 65,000 copies in the United States. In Europe, "Dusk Till Dawn" topped the European Border Breakers chart on the week ending 27 October 2017, and held onto the number-one spot for months, up until it eventually dropped to number two on the week ending 26 January 2018. The music video features Jemima Kirke. Directed by Marc Webb, the accompanying music video for "Dusk Till Dawn" premiered on YouTube on 7 September 2017, receiving over 10 million views in its first day. It is Webb's first music video in seven years. The music video finds Zayn on the run from two different groups, after he makes a sly hand-off with his mysterious accomplice played by actress Jemima Kirke. Soon after a brief confrontation Zayn outwits the law and escapes a pair of gangsters in an intense car chase and eventually lures both parties in a trap and drives off into the sunset with Kirke. The video was inspired by movies Casino and Goodfellas. According to Zayn, "It’s definitely a nod to a particular era of music videos. The early '90s, around that period, people really tried to make these epic, intense movies for their videos, Michael Jackson being a great example of that. I wanted to come back and give my fans something along those lines rather than just some blasé video." Rolling Stone's Elias Leight said that "Jemima Kirke and Zayn Malik are a modern day Bonnie and Clyde in the new clip" for Zayn's song. MTV's contributor praised the dramatic visuals and wrote "Dusk Till Dawn video is a huge step up from his previous music videos and we can’t help but wonder if this is only Part One of the story." Al Horner from Fact described the video as "a Chinatown heist mini-movie crammed into five action-packed minutes." As of January 2019[update], the music video has received more than 1.1 billion views on YouTube. ^ a b "Dusk Till Dawn (Radio Edit) / ZAYN". Tidal. 8 September 2017. ^ a b Renshaw, David (1 September 2017). "Zayn Announces New Single "Dusk Till Dawn" Featuring Sia". The Fader. ISSN 1533-5194. Retrieved 1 September 2017. ^ "ZAYN Releases 'Dusk Till Dawn' Featuring Sia – RCA Records". RCA Records. Retrieved 10 September 2017. ^ Billboard (1 September 2017). "Zayn Malik Announces 'Dusk Till Dawn,' New Song Feat. Sia". Billboard. Retrieved 4 September 2017. ^ "Zayn and Sia's 'Dusk Till Dawn' is Featured in 'Mountains Between Us' Trailer". Celebmix.com. 14 September 2017. Retrieved 16 September 2017. ^ Min, Lilian (8 September 2017). "Zayn Malik Reveals He Is Rapping on His New Album". Teen Vogue. Retrieved 12 September 2017. ^ a b c d e Horner, Al (8 September 2017). "ZAYN grew up on "epic, intense" 1990s music videos, and now he has one of his own". Fact. Retrieved 11 September 2017. ^ "BPM for 'Dusk Till Dawn - Radio Edit' by 'ZAYN'". songbpm.com. Retrieved 4 October 2017. ^ "Zayn feat. Sia "Dusk Till Dawn" Sheet Music in B Minor (transposable)". Musicnotes.com. Retrieved 4 October 2017. ^ McIntyre, Hugh. "Zayn And Sia Team Up For New Single 'Dusk Till Dawn'". Forbes. Retrieved 9 September 2017. ^ McIntyre, Hugh. "Zayn, Sia, Sam Smith And More Lead The Potential Last-Minute Grammy Submissions". Forbes.com. Retrieved 24 September 2017. ^ "See The Full List Of 60th GRAMMY Nominees". Grammy Awards. 28 November 2017. Retrieved 29 November 2017. ^ Michael Cragg (15 September 2017). "Zayn's Dusk Till Dawn". The Guardian. ^ a b c Leight, Elias (7 September 2017). "Watch Jemima Kirke in Noir Thriller For Zayn Malik, Sia's New Song". Rolling Stone. Retrieved 20 September 2017. ^ a b "Zayn Is Back With the Incredible 'Dusk Till Dawn' Video Featuring Sia". MTV. 7 September 2017. Retrieved 20 September 2017. ^ "Review: Zayn – "Dusk Till Dawn" ft. Sia". Spin.com. 7 September 2017. Retrieved 9 September 2017. ^ "Nielsen SoundScan charts – Digital Songs – Week Ending: 09/28/2017" (PDF). Nielsen SoundScan. Archived from the original (PDF) on 2 October 2017. Retrieved 2 October 2017. ^ "Official Charts Analysis: Post Malone secures second week atop singles chart". Music Week. Retrieved 20 October 2017. ^ "Wayback Machine" (PDF). Web.archive.org. 9 October 2017. Retrieved 6 January 2018. ^ "Zayn and Sia replace Dua Lipa as European Border Breakers No.1". Music Week. 27 October 2017. Retrieved 28 January 2018. ^ "Liam Payne and Rita Ora replace Zayn and Sia at European Border Breakers No.1". Music Week. 26 January 2018. Retrieved 28 January 2018. ^ Kaye, Ben (7 September 2017). "ZAYN is a wanted man in the Marc Webb-directed video for "Dusk Till Dawn" featuring Sia: Watch". Consequence of Sound. Retrieved 20 September 2017. ^ "Watch Zayn Malik's Intense Mini-Action Movie 'Dusk Till Dawn' Video". Billboard. Retrieved 8 September 2017. ^ "Australian-charts.com – Zayn feat. Sia – Dusk Till Dawn". ARIA Top 50 Singles. Retrieved 6 January 2018. ^ "Austriancharts.at – Zayn feat. Sia – Dusk Till Dawn" (in German). Ö3 Austria Top 40. Retrieved 11 October 2017. ^ "Ultratop.be – Zayn feat. Sia – Dusk Till Dawn" (in Dutch). Ultratop 50. Retrieved 16 December 2017. ^ "Ultratop.be – Zayn feat. Sia – Dusk Till Dawn" (in French). Ultratop 50. Retrieved 2 December 2017. ^ "Zayn Chart History (Canadian Hot 100)". Billboard. Retrieved 19 September 2017. ^ "Zayn Chart History (Canada CHR/Top 40)". Billboard. Retrieved 29 November 2017. ^ "Zayn Chart History (Canada Hot AC)". Billboard. Retrieved 29 November 2017. ^ "Croatia ARC TOP 100". HRT. Retrieved 11 November 2017. ^ Zayn feat. Sia — Dusk Till Dawn. Tophit. Retrieved 2018-12-20. ^ "ČNS IFPI" (in Czech). Hitparáda – Radio Top 100 Oficiální. IFPI Czech Republic. Note: Change the chart to CZ – RADIO – TOP 100 and insert 20184 into search. Retrieved 29 January 2018. ^ "ČNS IFPI" (in Czech). Hitparáda – Digital Top 100 Oficiální. IFPI Czech Republic. Note: Change the chart to CZ – SINGLES DIGITAL – TOP 100 and insert 201742 into search. Retrieved 24 October 2017. ^ "Danishcharts.com – Zayn feat. Sia – Dusk Till Dawn". Tracklisten. Retrieved 27 September 2017. ^ "Europe Official Top 100". Retrieved November 11, 2017. ^ "Zayn: Dusk Till Dawn (Feat. Sia)" (in Finnish). Musiikkituottajat – IFPI Finland. Retrieved 15 October 2017. ^ "Lescharts.com – Zayn feat. Sia – Dusk Till Dawn" (in French). Les classement single. Retrieved 7 November 2017. ^ "Offiziellecharts.de – Zayn feat. Sia – Dusk Till Dawn". GfK Entertainment Charts. Retrieved 13 October 2017. ^ "Billboard – Greece Digital Song Sales". Billboard. Retrieved 30 September 2017. ^ "Archívum – Slágerlisták – MAHASZ" (in Hungarian). Rádiós Top 40 játszási lista. Magyar Hanglemezkiadók Szövetsége. Retrieved 30 March 2018. ^ "Archívum – Slágerlisták – MAHASZ" (in Hungarian). Single (track) Top 40 lista. Magyar Hanglemezkiadók Szövetsége. Retrieved 21 September 2017. ^ "Archívum – Slágerlisták – MAHASZ" (in Hungarian). Stream Top 40 slágerlista. Magyar Hanglemezkiadók Szövetsége. Retrieved 28 September 2017. ^ "The Irish Charts – Search Results – Zayn". Irish Singles Chart. Retrieved 14 October 2017. ^ "Italiancharts.com – Zayn feat. Sia – Dusk Till Dawn". Top Digital Download. Retrieved 4 November 2017. ^ "Latvijas Top 40". Latvijas Radio. 31 October 2017. Retrieved 31 October 2017. ^ "Zayn Lebanese Chart Top 20 History". The Official Lebanese Top 20. 23 October 2017. Retrieved 23 October 2017. ^ "Top 20 Most Streamed International & Domestic Singles in Malaysia : Week 37 (8/9/2017 – 14/9/2017)" (PDF). Recording Industry Association of Malaysia. Retrieved 18 October 2017. ^ "Mexico Airplay: Nov 11, 2017". Billboard. Retrieved 16 May 2018. (Subscription required (help)). ^ "Nederlandse Top 40 – week 45, 2017" (in Dutch). Dutch Top 40 Retrieved 11 November 2017. ^ "Dutchcharts.nl – Zayn feat. Sia – Dusk Till Dawn" (in Dutch). Single Top 100. Retrieved 22 September 2017. ^ "Charts.nz – Zayn feat. Sia – Dusk Till Dawn". Top 40 Singles. Retrieved 13 October 2017. ^ "Norwegiancharts.com – Zayn feat. Sia – Dusk Till Dawn". VG-lista. Retrieved 14 October 2017. ^ "BillboardPH Hot 100". Billboard Philippines. 2 October 2017. Retrieved 2 October 2017. ^ "Listy bestsellerów, wyróżnienia :: Związek Producentów Audio-Video". Polish Airplay Top 100. Retrieved 6 November 2017. ^ "Portuguesecharts.com – Zayn feat. Sia – Dusk Till Dawn". AFP Top 100 Singles. Retrieved 25 October 2017. ^ "Media Forest – Weekly Charts. Media Forest. 4 December 2017. Retrieved 2 July 2018. Note: Romanian and international positions are rendered together by the number of plays before resulting an overall chart. ^ "Russia Airplay Chart for 2017-11-13." Tophit. Retrieved 2018-12-20. ^ "Official Scottish Singles Sales Chart Top 100". Official Charts Company. Retrieved 30 September 2017. ^ "ČNS IFPI" (in Slovak). Hitparáda – Radio Top 100 Oficiálna. IFPI Czech Republic. Note: insert 201820 into search. Retrieved 22 May 2018. ^ "ČNS IFPI" (in Slovak). Hitparáda – Singles Digital Top 100 Oficiálna. IFPI Czech Republic. Note: Select SINGLES DIGITAL - TOP 100 and insert 201737 into search. Retrieved 18 September 2017. ^ "SloTop50: Slovenian official singles weekly chart" (in Slovenian). SloTop50. Retrieved 29 January 2018. ^ "Spanishcharts.com – Zayn feat. Sia – Dusk Till Dawn" Canciones Top 50. Retrieved 21 December 2017. ^ "Swedishcharts.com – Zayn feat. Sia – Dusk Till Dawn". Singles Top 100. Retrieved 13 October 2017. ^ "Swisscharts.com – Zayn feat. Sia – Dusk Till Dawn". Swiss Singles Chart. Retrieved 9 October 2017. ^ "Official Singles Chart Top 100". Official Charts Company. Retrieved 16 September 2017. ^ "Zayn Chart History (Hot 100)". Billboard. Retrieved 18 September 2017. ^ "Zayn Chart History (Adult Pop Songs)". Billboard. Retrieved 10 October 2017. ^ "Zayn Chart History (Pop Songs)". Billboard. Retrieved 5 December 2017. ^ "ARIA End of Year Singles 2017". Australian Recording Industry Association. Retrieved 5 January 2018. ^ "Ö3 Austria Top 40 – Single-Charts 2017". oe3.orf.at. Retrieved 29 December 2017. ^ "Jaaroverzichten 2017". Ultratop. Retrieved 21 December 2017. ^ "Radio & YouTube Hits. Top Year-End Hits 2017". Tophit. 2017. Archived from the original on 2018-09-13. Retrieved 2018-12-06. ^ "Top 100 Single-Jahrescharts". GfK Entertainment (in German). offiziellecharts.de. Retrieved 29 December 2017. ^ "Single Top 100 – eladási darabszám alapján – 2017". Mahasz. Retrieved 17 February 2018. ^ "Stream Top 100 – 2017". Mahasz. Retrieved 17 February 2018. ^ "Airplay 100 – Top of the Year 2017" (in Romanian). Kiss FM. Retrieved 3 July 2018. ^ "Top City & Country Radio Hits Russia 2017". Tophit. 2017. Archived from the original on 2018-09-13. Retrieved 2018-11-20. ^ "End of Year Singles Chart Top 100 – 2017". Official Charts Company. Retrieved 10 January 2018. ^ "Jaaroverzichten 2018". Ultratop. Retrieved 21 December 2018. ^ "Rapports Annuels 2018". Ultratop. Retrieved 21 December 2018. ^ "Canadian Hot 100 – Year-End 2018". Billboard. Retrieved 5 December 2018. ^ "Top 100 Single-Jahrescharts". GfK Entertainment (in German). offiziellecharts.de. Retrieved 21 December 2018. ^ "Top 100-Jaaroverzicht van 2018" (in Dutch). Dutch Top 40. Retrieved 5 January 2019. ^ "Airplay 100 – Topul Anului 2018" [Year-end chart 2018] (in Romanian). Kiss FM. 30 December 2018. Retrieved 30 December 2018. ^ "Årslista Singlar – År 2018" (in Swedish). Sverigetopplistan. Retrieved 15 January 2019. ^ "Schweizer Jahreshitparade 2018 – hitparade.ch". Hung Medien. Retrieved 31 December 2018. ^ "ARIA Chart Watch #469". auspOp. 21 April 2018. Retrieved 21 April 2018. ^ "Austrian single certifications – Zayn feat. Sia – Dusk Till Dawn" (in German). IFPI Austria. Retrieved 29 May 2018. Enter Zayn feat. Sia in the field Interpret. Enter Dusk Till Dawn in the field Titel. Select single in the field Format. Click Suchen. ^ "Ultratop − Goud en Platina – singles 2017". Ultratop. Hung Medien. Retrieved 22 December 2017. ^ "Canadian single certifications – Zayn Feat. Sia – Dusk Till Dawn". Music Canada. Retrieved 16 February 2018. ^ "Zayn Feat. Sia "Dusk Till Dawn"". IFPI Denmark. 5 December 2017. Retrieved 12 December 2017. ^ "French single certifications – Zayn feat. Sia – Dusk Till Dawn" (in French). Syndicat National de l'Édition Phonographique. Retrieved 1 March 2018. ^ "Gold-/Platin-Datenbank (ZAYN feat. Sia; 'Dusk Till Dawn')" (in German). Bundesverband Musikindustrie. Retrieved 12 January 2018. ^ "Italian single certifications – Zayn feat. Sia – Dusk Till Dawn" (in Italian). Federazione Industria Musicale Italiana. Retrieved 2 January 2019. Select "2018" in the "Anno" drop-down menu. Select "Dusk Till Dawn" in the "Filtra" field. Select "Singoli online" under "Sezione". ^ "New Zealand single certifications – Zayn feat. Sia – Dusk Till Dawn". Recorded Music NZ. Retrieved 15 December 2017. ^ "Polish single certifications – Zayn feat. Sia – Dusk Till Dawn" (in Polish). Polish Society of the Phonographic Industry. Retrieved 5 December 2018. ^ "Portuguesecharts.com – Singles Top 100 (07/2018)". Associação Fonográfica Portuguesa. Retrieved 22 February 2018. ^ "Spanish single certifications – ZAYN feat Sia – Dusk Till Dawn (Radio Edit)" elportaldemusica.es. Retrieved 11 January 2018. ^ "Guld- och Platinacertifikat" (in Swedish). IFPI Sweden. Retrieved 9 March 2018. Type Zayn feat. Sia in the top right search bar. Click on "Sok" and select "Visa" under Dusk Till Dawn to see certification. ^ "The Official Swiss Charts and Music Community: Awards (Zayn feat. Sia; 'Dusk Till Dawn')". IFPI Switzerland. Hung Medien. Retrieved 18 December 2018. ^ "British single certifications – Zayn feat. Sia – Dusk Till Dawn". British Phonographic Industry. Retrieved 9 February 2018. Select singles in the Format field. Select Platinum in the Certification field. Type Dusk Till Dawn in the "Search BPI Awards" field and then press Enter. ^ "American single certifications – Zayn feat. Sia – Dusk Till Dawn". Recording Industry Association of America. Retrieved 15 February 2018. If necessary, click Advanced, then click Format, then select Single, then click SEARCH. ^ "Radio 1 Playlist". BBC. 12 August 2017. Retrieved 8 September 2017. ^ "Top 40/M Future Releases". All Access Music Group. Retrieved 8 September 2017. ^ "Zayn ft. Sia - Dusk Till Dawn RadioDate". Radioairplay.fa. 2 October 2017. Retrieved 2 October 2017.